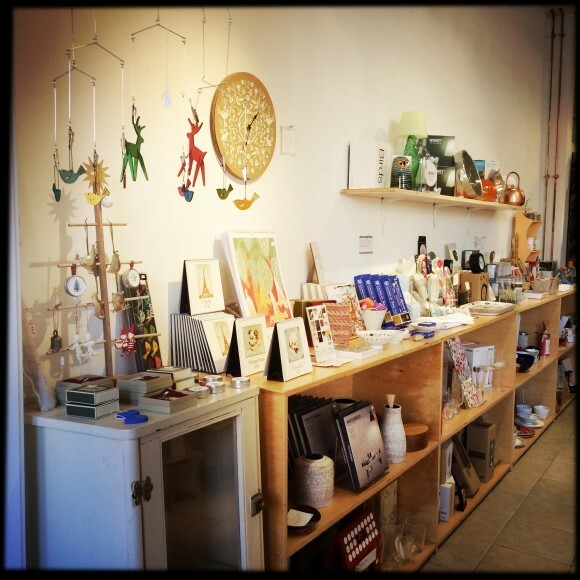 p o o k s t y l e at 2 Park Row in Chatham, New York, is one of the most charming gift shops around. 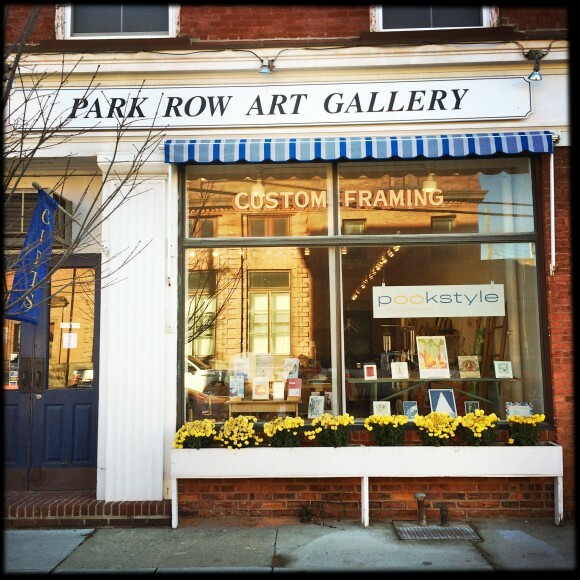 It’s owned by Kaarin “Pook” Lemstrom-Sheedy, a veteran bookstore and museum shop retailer, who shares space with Park Row Gallery & Framing. 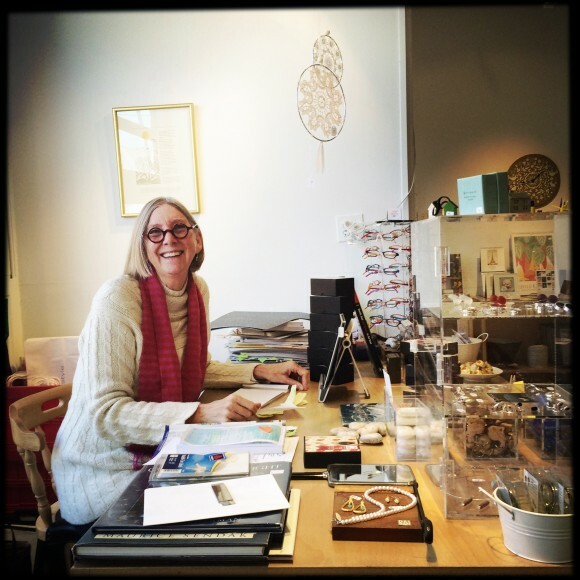 She says she’s having the time of her life with the shop and her joy shines through in the gifts she stocks. 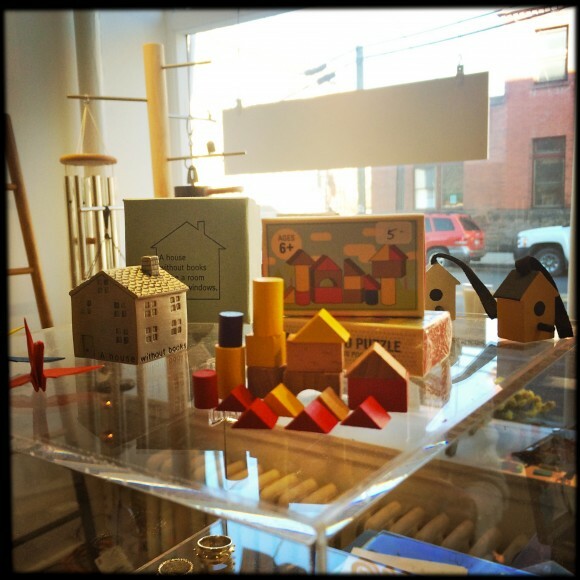 Prior to launching p o o k s t y l e in 2010, Kaarin managed the iconic Scribner Bookstore and Barnes & Noble 128 Fifth Avenue Sales Annex in Manhattan, and she designed and ran museum gift shops at the Whitney Museum of American Art, MASS MoCA, the Mount, and Hancock Shaker Village. Gina: What defines p o o k s t y l e? Kaarin: Clean, modern designs from the U.S. and around the world, with a pinch of humor and a dash of whimsy thrown in for good measure. “Pook” is the name my father gave me as a baby, and prior to opening p o o k s t y l e, the only people who called me by that name were my family and very oldest and closest friends, so I had to think carefully about releasing it into the world. Happily, it has been a very pleasant and good experience. I’ve met many other pooks and pookies—both two and four legged! Customers usually ask if they can call me pook once they know what it means, and I always say yes! 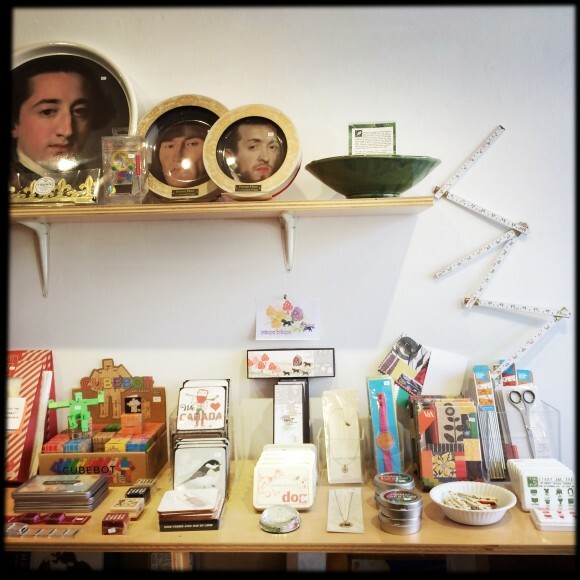 My shop has been described (by Rural Intelligence) as a “museum store without a museum” and I think that’s quite fitting; it seems my roots are showing. 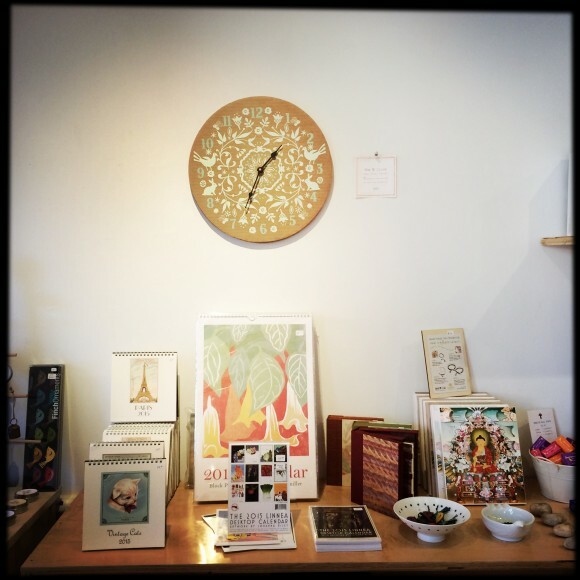 One of my guiding philosophies, a holdover from my museum years, is the desire to offer “something for everyone” and I therefore have a fairly broad range of price points—everything from a $300 Japanese copper teapot to a “folding ruler” for $6. p o o k s t y l e offers things that I love, like, and/or believe in. My hope is that others will share my enthusiasms, and so far, anyway, so good! 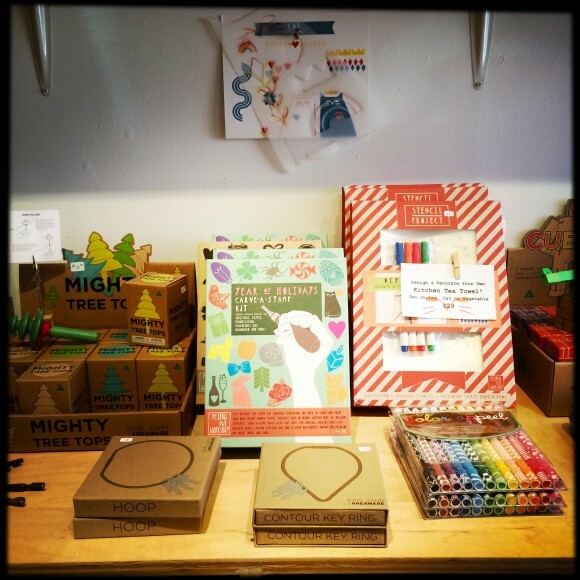 I should also add that at the shop’s core, shoppers will find many Scandinavian products. This “flavor” comes from my childhood in Amesbury, Massachusetts—my Dad was a Finn and my Mom an Olson, so growing up, there were many Scandinavian things in our home. Gina: What makes a great gift? Kaarin: Something that the giver feels good about giving—whether it’s because they know it’s just the right fit for the recipient, or because it’s something they have discovered and feel delighted and excited about personally and can then pass that delight along in the giving. Gina: What are your thoughts on fun hostess/host gifts? Kaarin: Things that are attractive, maybe a little out of the ordinary, but also useful. For example, I carry a wonderful line of felt coasters from DAFF of Germany, in a whole range of fabulous colors. I encourage my customers to mix and match—have a little fun and at the same time customize and personalize the gift for your recipient. I carry at all times a variety of delicious Swedish jams—gooseberry, lingonberry, black currant. Always a lovely and tasty offering—and again, most useful. Gina: What’s the best gift anyone ever gave you? Kaarin: When my now husband, then boyfriend, Bob, and I were dating, he gave me a flute one Christmas, something that had been on my Xmas list—along with a harpsichord (hey, a girl could dream!) —for many years. I believe it was a little beyond my parents means to buy me either one, much as they would have liked to, so when I opened that gift on Christmas Day, with my family all around me, my mother and I began to cry! My Mom later said that was when she knew that Bob was the “one for me.” 43 years later (41 wed, 2 dating), I’d say she had it right. Kaarin: These are Swedish mini Shea butter soaps: lingonberry (lingon), blueberry (blabar), and cloudberry (hjortron) and Swedish egg white facial soap. 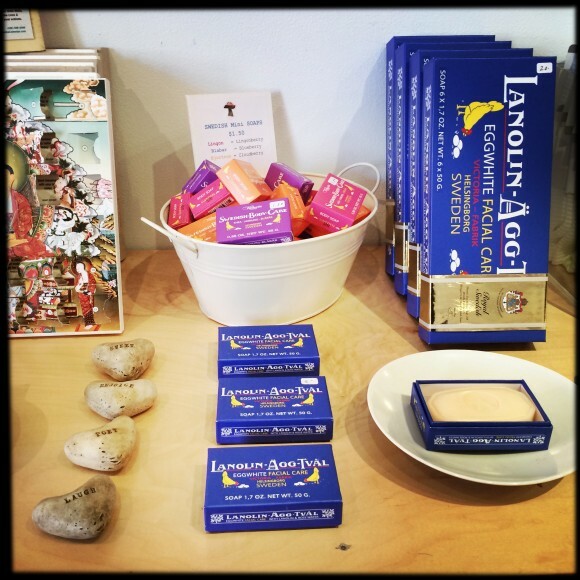 I’m very fussy about smells, but I love the fresh, light scent of these Swedish bars. I’ve been giving the egg white facial bar to an 89-year-old friend of my late Mom’s for years, and she swears that it works wonders on her aged skin! Great stocking stuffers, all. Kaarin: I love the whimsical design of the B clock—the “B” theme as in bees, birds, and bunnies, the element of surprise when customers realize that it is made of lightweight recycled cardboard. It’s elegance created from everyday, humble materials—love that formula! Kaarin: p o o k s t y l e features an ever changing selection of used and rare design books pulled from sister store, Berkshire Books (which my husband Bob helms, and which is located right around the corner at 2 Park Row), as well as one-of-a-kind, unusual, hand-selected titles sprinkled throughout the shop. 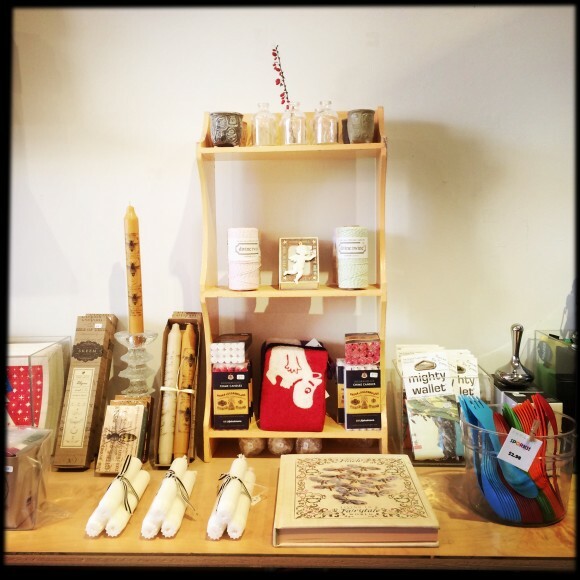 Kaarin: A Cabinet of Curiosities at p o o k s t y l e includes rolls of colored cotton string, footed ceramic vessels by Cape Cod potter Frances Kate Johnson, tiny glass vases, angel ornaments from Denmark, red and white Yule candles from Sweden, and felt Moomim purses. On the counter are bundles of the most wonderful, longest-lasting white taper candles from Sweden (which are a p o o k s t y l e staple). Kaarin: As long as there’s a p o o k s t y l e, there will be rubber stamps and art supplies! This is a terrific new Year of Holidays Stamp Carving Kit from Yellow Owl Workshop, creators and champions of clever rubber stamps of all kinds. There are also handsomely boxed brass key rings from Areaware (old keys being another p o o k s t y l e passion). Color Appeel crayons, ridiculously awesome crayon sticks with fun peel-to-reveal action. The Tea Towel Stencil Kits include two blank 100% cotton tea towels, drawing stencils, and fabric markers. Choose either the veggie or cat motif and have a ball creating your one-of-a-kind tea towel masterpieces! Kaarin: A typical p o o k s t y l e mix of fun and whimsical gifts: Melamine portrait plates from London’s National Gallery, classic folding Swedish ruler, brightly colored fabric watches, rubber stamp kits, ink stamp pads in a wide variety of colors, Sturdy cork coasters: choose from We Heart Canada, Chickadee, Snow Shoes. Boxed Cubeots (“a wooden puzzle with a playful personality”). 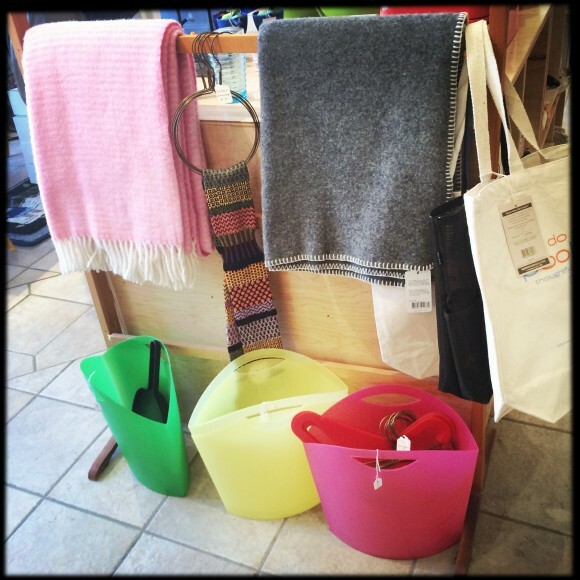 Kaarin: Here are soft lamb’s wool throws in pink and grey from Klippan, Sweden and a round, ingeniously designed scarf hanger from Japan. The cheerfully colored plastic bins were originally designed as baskets for marketing (veggies in particular stay fresh and intact), but there are any number of uses for these sturdy, light weight containers. I use mine as an elegant guest room wastebasket! Kaarin: A delightful tiny village contained in a matchbox. Made in the Netherlands, the 17 wooden pieces can be arranged in endless combinations. A sweet, diminutive stocking stuffer! 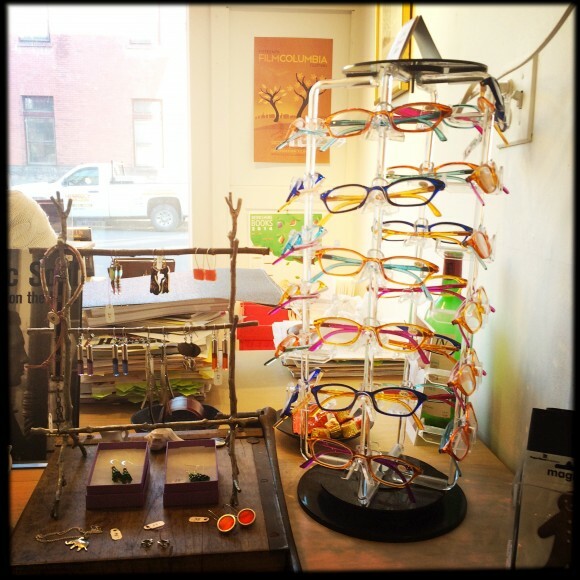 Kaarin: In keeping with my “something for everyone” philosophy, p o o k s t y l e carries a selection of playful and unusual jewelry in a variety of price points. 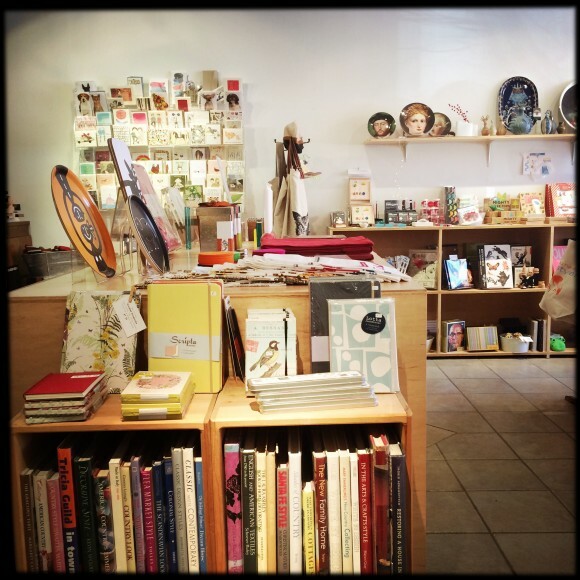 Fun, affordable readers fly out of the store. Available in four different color combinations, many customers buy one of every color and then place them throughout the house, ever at the ready! 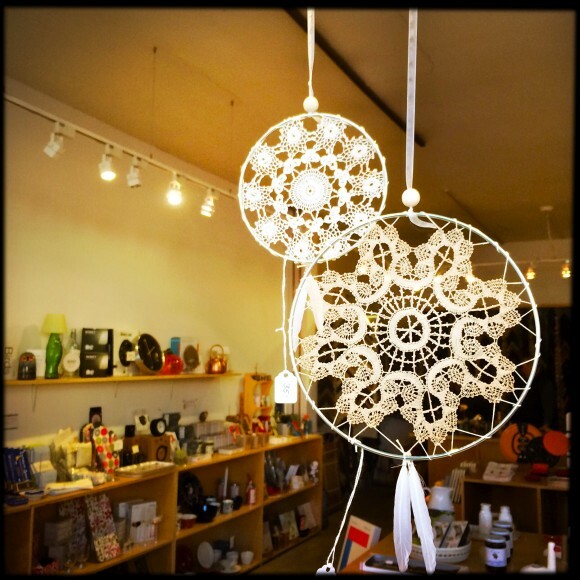 Kaarin: These beautiful dreamcatchers are made from vintage Canadian laces. No two alike and they’re available in two sizes. Sweet dreams nearly certain. Author Gina Hyams is creating a book titled The Tanglewood Picnic: Music and Outdoor Feasts in the Berkshires. 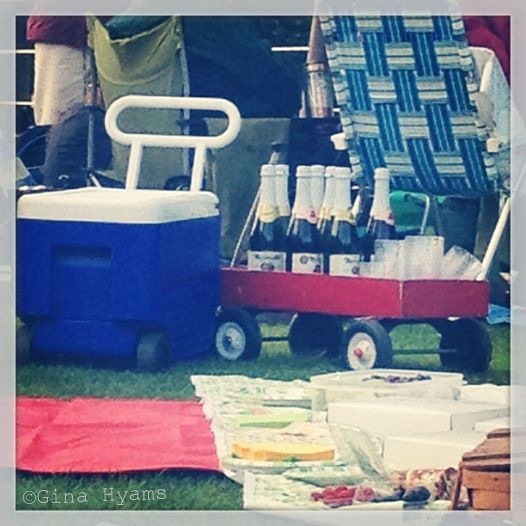 The gift book will celebrate the tradition of picnics held on the Lawn during concerts at Boston Symphony Orchestra’s summer campus in Lenox, Massachusetts. The book will be both a charming historic document and inspiration for over-the-top picnic style. It is scheduled for publication summer 2015. Hyams seeks photos of Tanglewood picnics (both lavish and modest), favorite picnic recipes, outdoor dining tips, and related picnic ephemera (such as invitations and menus) from all eras of the festival’s eight-decade history. Submissions of multiple images are welcome. She is particularly interested to hear from people who have made a beloved tradition of picnicking on the Lawn. Due to print quality restrictions, only high-resolution images can be considered for inclusion (300dpi+ — either scanned or photographed with an iPhone or digital camera). If you have prints and don’t have access to a scanner, Gina will be happy to scan images and return the originals. Email her at the address below and she’ll send you her snail mail address. Please note caption information, including as much of the following as is known: date, occasion, names of people in the image, types of foods pictured, the name of the photographer, and estate to credit as necessary. Please also answer this question: What do you love about Tanglewood picnics? Include your name, address, and phone number. Submissions will be considered for both print publication and posting on the project’s blog: TanglewoodPicnicBook.tumblr.com. Deadline for submissions: September 30, 2014. Gina Hyams is a Berkshire-based writer and editor who specializes in food, travel, and the arts. She has published eleven books, among them Country Living Decorating with White (Hearst), In a Mexican Garden: Courtyards, Pools, and Open-Air Living Rooms (Chronicle Books), and Pie Contest in a Box: Everything You Need to Host a Pie Contest (Andrews McMeel Publishing). Hyams was a contributing editor to Berkshire Living and a correspondent for Fodor’s Travel Publications. Her essays and articles have appeared in Huffington Post, Newsweek, San Francisco, Organic Style, Ideal Destinations, Healing Lifestyles & Spas, and Salon, as well as broadcast on National Public Radio. For more information, see www.ginahyams.com. 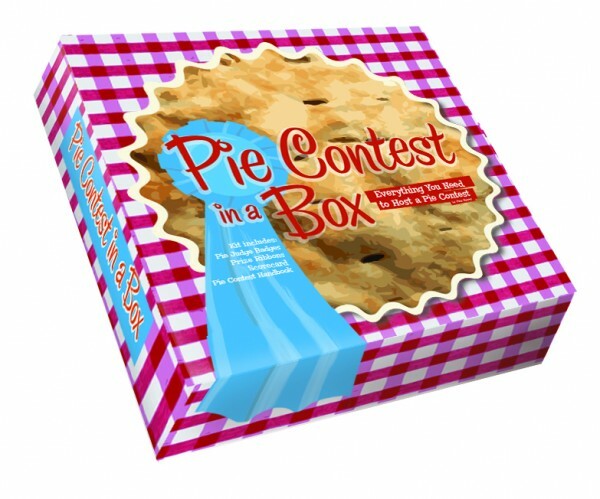 It is with joy and a true sense of wonder (mixed with smug satisfaction that my pig-headed notion that this was a genius idea proved correct) that I announce the sale of my “Pie Contest in a Box” to Andrews McMeel for publication summer 2011 in the United States, Canada, United Kingdom, New Zealand, and Australia. Thanks to Jean at Mansion Street Literary Management for waving her magic wand to make it happen and to Aurel de st Andre for the beautiful prototype design. Me and Goose’s friend Loki’s mom, Hope Sullivan, who runs IS183 and who walks/runs/chats-about-writing with me at dawn now and then, and her artist friend, Dan Mahoney, at the Berkshire International Film Festival opening night party at Pearl’s in Great Barrington. Photo by Seth Rogovoy. My head is still spinning from the incredible weekend of films. I don’t have time for a full report just now, but hope to debrief soon.